Wicked problems have a more profound effect on our future than ever before. Still, we are unsure how to run our governments, organisations and companies the way that these complex problems could be solved. We asked 29 leadership experts and here’s what they said we should do. Eeva Hellström is a senior lead in strategy in Sitra's foresight operations. Behind these words, you can find someone who is both a thinker and a doer. In her hands, complicated content is creatively fused and individual ideas are shaped into effective concepts. Mikko Kosonen is the President of Sitra. His main task involves allocating Sitra's intellectual and financial resources in a way that enables Finland to become a pioneer in sustainable well-being. Jenna Lähdemäki is a member of Sitra’s Foresight team, whose work involves the vision of sustainable well-being and the future of education. Jenna is kept busy especially by the book Learning at the Edge of History, which will be published in autumn 2017, and her work on Next Era, a vision launched by Sitra. Addressing complex societal challenges – or what are known as wicked problems – is placing ever greater demands on national and regional governments, international organisations and corporations. Although wicked problems are having a more profound effect on our future than ever before, we are reluctant to engage with their underlying complexity. Our policymaking and strategic tools are ineffective and our institutions and leaders ill-prepared. 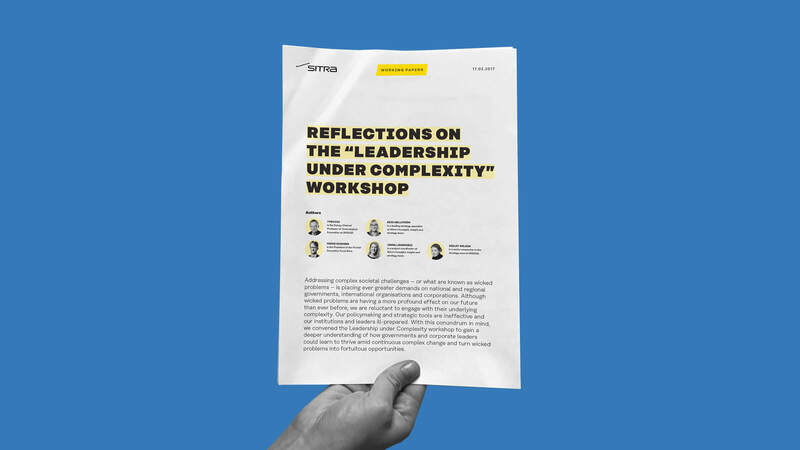 With this conundrum in mind, we convened the Leadership under Complexity workshop to gain a deeper understanding of how governments and corporate leaders could learn to thrive amid continuous complex change and turn wicked problems into fortuitous opportunities. Should the world be a planning project? How can technology be misused? How do we do things in the future? What will future generations consider odd about today? Who decides in the future and how?